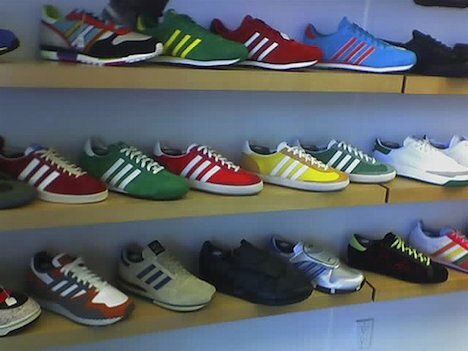 Sportswear giant Adidas is reportedly planning to sell sneakers for $1 (about 52 rupees) in India. The idea of selling cheap shoes was apparently inspired by Mohammad Yunus, Nobel Prize-winning founder of microfinance bank, Grameen Bank, in Bangladesh. After failing to break even with a pilot project of 5,000 pairs of shoes in Bangladesh, Adidas now believes it can make the idea work in India instead. India’s growing population of nearly 1.2 billion people is expected to eclipse even China’s population (currently over 1.3 billion) in the next 10 years, with many people becoming increasingly affluent. If the plan works, no doubt Adidas sees it as a way of achieving a large share of the market in India as this unfolds. Adidas CEO Herbert Hainer has been reported as saying that mass production in India can potentially better support the growing market there. Hainer reported that in the Bangladesh pilot, the sneakers cost $3 to make and $3.50 had to be paid in import duty. Presumably it will be cheaper to produce the shoes in India. Adidas wants the project in India to be self-funding, rather than an being an aid project. The company is planning to sell the sneakers in villages through a distribution network. Is making inexpensive sneakers available to poor people in India in this way an admirable endeavour, or do you think the company is trying to take advantage? Perhaps a bit of both? In recent years mobile phone companies have found success selling inexpensive mobile phones throughout India. It could certainly be argued that although the corporations profit, connecting people who would otherwise not have access to this kind of communication technology, empowers them and helps lift them out of poverty. Could the same be argued of comfortable, durable, branded sneakers? Another question that may be on your mind, because it certainly crossed mine, is: if Adidas can actually manage to make and sell sneakers for $1, or even quite a lot more than that, how much of a profit must they be making on those $100 sneakers sold in other countries? Recently, we’ve also reported on other shoe-makers launching initiatives aimed at greater sustainability, such as New Balance introducing sneakers made from recycled plastic bottles, Puma planning to produce compostable sportswear, Nike announcing a new green venture capital arm to fuel innovation, and Patagonia even urging customers to buy less and repair and reuse more of their products. There’s no word so far of this kind of thinking being included in what could turn out to be a huge and profitable new project for Adidas, or not. I hope that if the project is successful, it starts to move in that direction. If sneakers could cost $1, and they could be fully recycled and made into the next new model of $1 sneakers, then we’d really have something there.